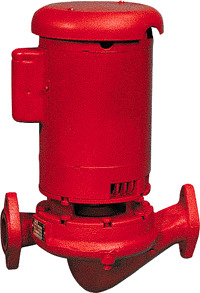 Close-coupled in-line mounted pump available in 1 through 2 sizes. 1/4 HP through 2 HP at 1750 RPM and 1/2 through 15 HP at 3500 RPM. Available in bronze-fitted construction with flows to 200 GPM, heads to 225 feet. Bell & Gossetts internally flushed BUNA/Carbon ceramic seal makes the Series 90 a truly worry-free pump.